This weekend we will celebrate the Fiesta de las Cruces also called Cruz de Mayo. In English, the name of the celebration could be translated as Festival of the Crosses or May Cross. If you don’t know what it is all about just keep reading! The fiesta de las Cruces it is the annual celebration which always takes time at the end of the April beginning of May and it is especially popular and important festival in the countries of Central and South America such as Mexico, Colombia, Peru, Venezuela etc. and in Spain. The Cruz de Mayo has a very deep religious meaning. It is a celebration during which everyone is trying to find the cross on which Jesus died. The tradition was first brought to Spain by Roman Empire and later on spread to the Latin America. 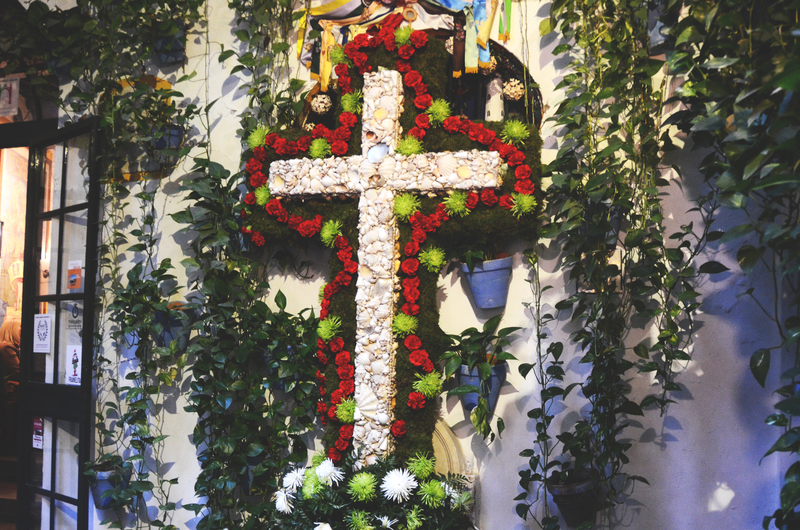 In Spain, the Cruz de Mayo is widely celebrated in many provinces, cities, and villages, especially across Andalucia. Granda, Malaga, Seville, Valencia, Almería, Alicante are just very few names were this festival takes place. However, Cordoba is considered to be a queen of the Dia de la Cruz. Dia de las cruces have a cross-dressing practice which started in 18th of Century, however, the concept of competing for the most beautiful cross started in Cordoba in 1954. Since then other places where the celebration is taking place also integrated competition mode into the festival. The citizens and villagers are decorating crosses with flowers and other elements which later on are judged and have the possibility to win some prizes. The cross itself normally have to fulfill certain standards. Most of them are 3 meters high and decorated with white and red flowers. However, sometimes you might find some of the crosses decorated wth green, yellow, pink flowers. In some cities, some of the crosses can represent a certain theme. For example, in Nerja, you may find crosses with the theme of the sea. Although May Crosses festival In Spain is always taking place at the very end of April or beginning of May it is very often celebrated the nearest Sunday of 1st of May. 1st of May in many countries is known as International Workers’ Day and it very often confused with the festival of the Cruz de Mayo. Despite having a religious origin you will be surprised the way the festival is celebrated. If you live in Spain, or you visited Spain especially Andalucia during the Semana Santa, we can tell you the Dia de las Cruces is nothing like that! Next to the cross, you may often find a bar which serves some buzz and tapas in order to attract more people. Also, you will hear playing so-called Sevillanas and you will see many people dancing flamenco dressed in their flamenco also called gypsy costumes. Nowadays, you might find come across a more contemporary style of celebration going on such as rock. All the crosses which are enrolled in competition presented on the map which is prepared by ayuntamiento. The maps normally are given out around the city center and also can be found in information centers as well as little tobacco shops called Estancos. In the cities and villages where the festival takes place only one day, the crosses are built at 9 am on the day of the festival, and remain in place until at least the evening. The celebration itself with the music and dances normally starts at midday and ends around 10 pm. Ready to live most intense one-day celebration of the year?